← Book Suggestions for 11-14 year olds. Our family loves reading history and learning it. The famous quote, usually attributed to writer and philosopher George Santayana, “Those who cannot remember the past are condemned to repeat it.”, I believe is very significant. We need not just to learn history BUT to learn from history. 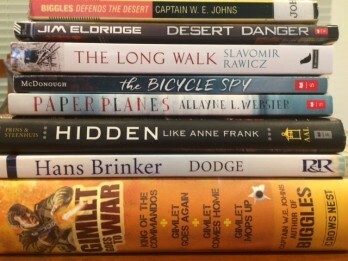 Over the last several years, our family has loved reading books about World War 2 and about Russia during the Cold War. Most of these books have centred on Jewish children surviving the world. I have listed all the books that we have read on World War 2. I especially encourage you and your children to read the books listed at the beginning marked with ***. These were our favourite books, along with the first two books listed under ‘Russia – the Cold War’.